This monkey is ready to hurl his coconut into the nearest cup. You know what’s a better introduction to Coconuts than anything I could write? Read on for my thoughts on Coconuts! Coconuts is a catapulting dexterity game for two to four players. The first player to claim (and retain) six cups wins. 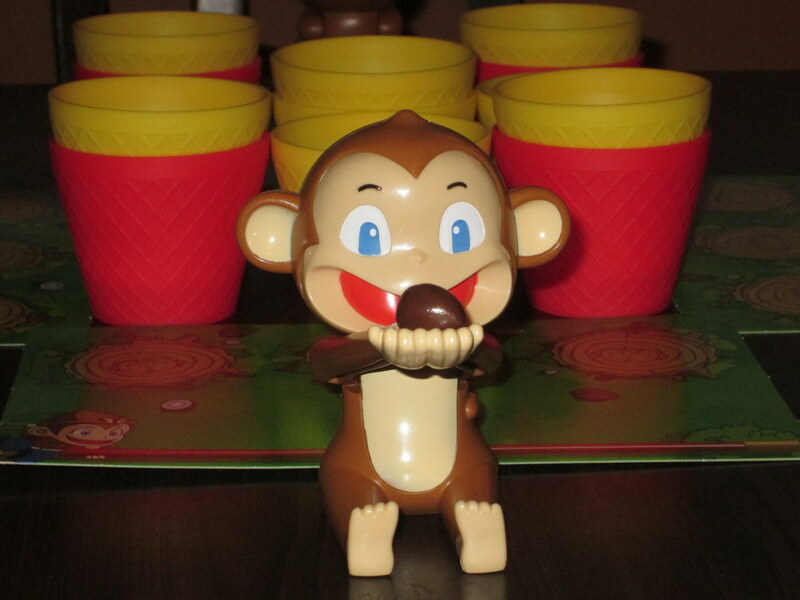 At the start of the game, each player receives a monkey catapult and eight coconuts. 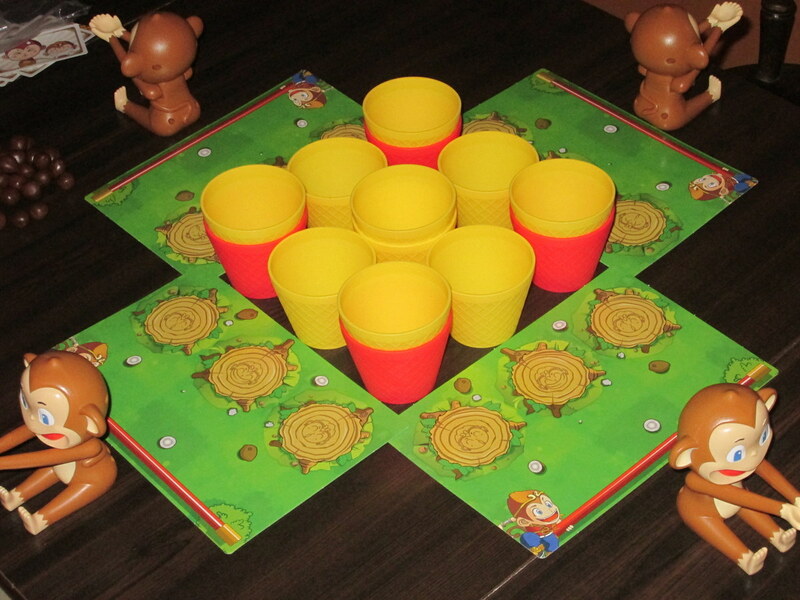 Players arrange the cups on the playing field according to the diagram in the rules. Coconuts set up for four players. Or monkeys. 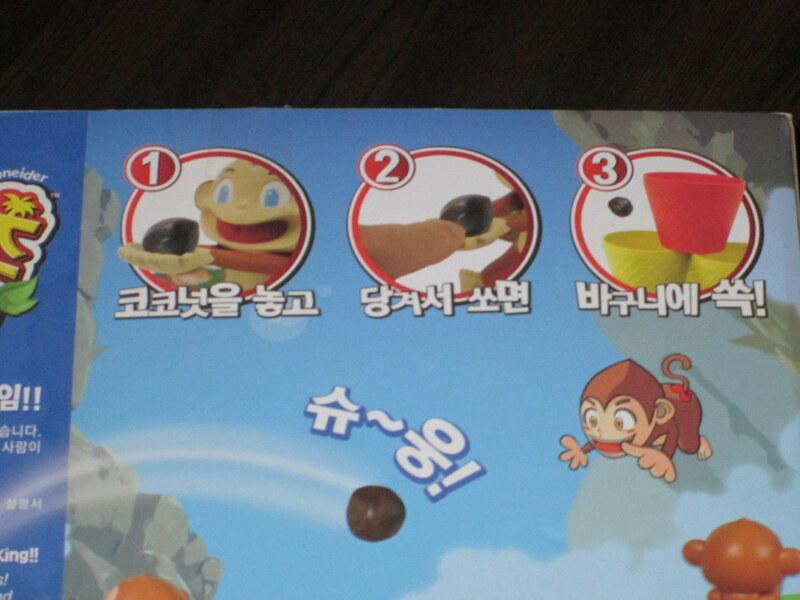 On a turn, players place their monkey behind the red line on their player boards and release a coconut from the catapult. If the coconut lands in a cup, the player claims that cup and places it on their player mat. If the cup is red, the player receives an additional turn. If the coconut lands in an opponent’s cup, the player claims that cup (so cups can change hands). 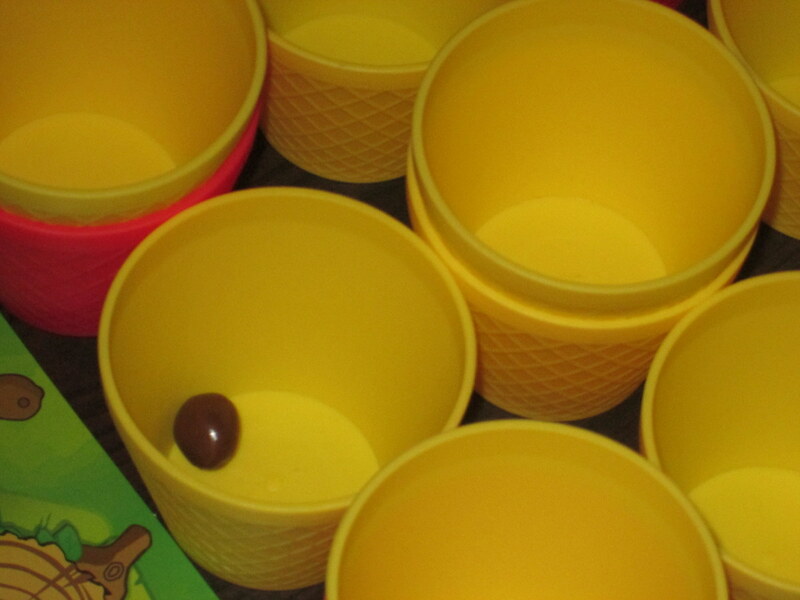 The game ends when either one player claims a sixth cup or when all the coconuts are in cups. If the game ends with the sixth-cup claimed, that player wins; otherwise, whoever has the most coconuts in the cups they’ve collected wins. There is also an advanced variant included in the box that gives each player two special ability cards to play during the game. A Simple Question of Weight Ratios? 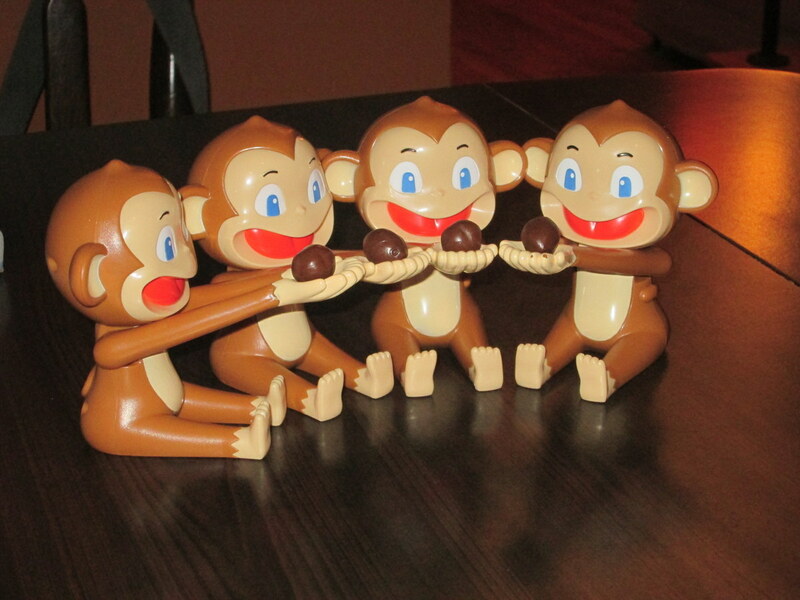 Yes, this is a game about monkey catapults and rubber coconuts that look like Milk Duds. Yes, this is intentionally ridiculous. Yes, this game is way more fun than it has any right to be. I’ve mentioned before that I love dexterity games. I love Click Clack Lumberjack (formerly Toc Toc Woodman), for example–that silly Jenga-like game of felling a tree with nothing but a tiny ax. I love FlowerFall, a game of claiming flower patches that is exactly what it sounds like. Crokinole isn’t silly (I dare not say so, at any rate, since Andrew is Canadian), but I love it all the same, and I recently have loved playing Flick Wars. As you can see, I am naturally predisposed to love the coconut-flinging zaniness that is Coconuts. So please, if I seem to be raving, consider this my expected love letter to dexterity games. The back of the box isn’t in English, but even here you can get a sense that the rules are SIMPLE. Coconuts, aside from being zany, is addictive. Games are short and fast-paced, and I’ve never sat down and played just one game. Once the cups have been claimed or the coconuts exhausted, there has never been a question of putting it away: each set of opponents has immediately begun the task of resetting the cups on the board, as if no one has entertained the possibility that we would play just one game and then what next? The game is ridiculous and silly, but it’s so fun, and especially after losing, players want to give the game another go, now that they’ve become accustomed to their monkey catapult. And, as in most dexterity games, the components make or break Coconuts. Well, in this case, they make it–very much so. The monkey catapults are perfect. They have just the right amount of spring and tension. They’re precise enough that players feel in control of their shots, yet the rubber coconuts themselves makes the results somewhat unpredictable. And this is just as it should be. I’ve mentioned elsewhere that one of the things I love about dexterity games is their often equalizing effect: skilled players will make bad shots; novices will make inspired ones. This doesn’t eliminate the skill gap, but it does neutralize it in some ways. It at least keeps new players from despair. “Maybe I can win if we just…play…again…” The plastic cups that come in the game are also perfect. They are wide enough to accommodate well-aimed coconuts, and they make a gratifying sound as you stack them on your player board. The player boards and cards that come with Coconuts are definitely the low point here. They’re on cheap stock, but since neither is the focus of the game, or even used very much beyond forming the fault line, this isn’t an issue at all. The game excels where it needs to. The game includes special action cards if you want to use them. I don’t, usually. Coconuts is a very different experience as you change the player count. The two-player game is a more forgiving back-and-forth. There isn’t a lot of necessary stealing; it’s more a matter of who can claim their six cups first. The three- and four-player affair…well, it can get downright nasty. The reason is that there aren’t enough cups for every player to get close to six cups on their own; they have to aim for the other players. This means that games often end by a depleted coconut supply, rather than a clean, six-cup win. I’m not sure which mode I prefer. In fact, I’m not sure I prefer one mode over another. The two-player game is excellent (one my wife have played over and over and over again), but so is the larger game. This really hits its two to four player mark well. What are you all smiling about, anyway? It’s also a different experience if you include the cards. 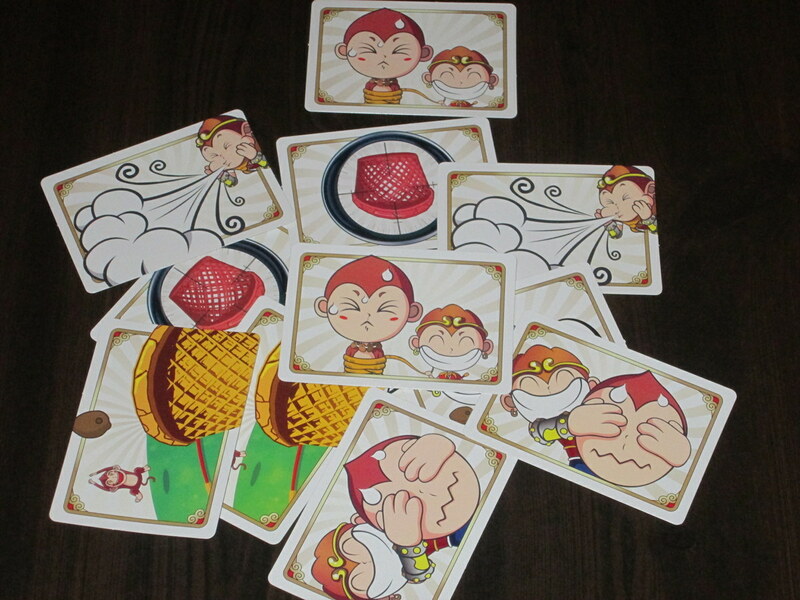 The cards add wacky abilities, like blowing during another player’s turn to steer their coconuts off course or forcing them to shoot from far away or while their eyes are closed. There are also cards that force other players to lose turns, which are easily removed. My take on these? I don’t like them. I’d rather play the straight game of coconuts, skill against skill, which is already a hilarious way to pass the time. The game moves quicker, and it’s zany on its own. Then again, it is also funny to watch your wife dissipate into laughter because all the breath in your body is channeled toward blowing the coconut she’s about to launch back into her supply. So, your mileage may vary. The negative thing about Coconuts–aside from Serious Gamers, beware! there be dragons here–is that the included coconuts are rubbery and very bouncy, which means players must be vigilant if they don’t want to lose their pieces. I’ve played with mostly considerate folk who have helped me search the floor in quest of lost coconuts, but if you’re playing with children, you might need to reiterate that you don’t want to lose the pieces. Also, make sure they don’t eat the coconuts–they really do look like Milk Duds and have almost enticed my sleep-deprived brain into believing they were sustenance. Ahem. 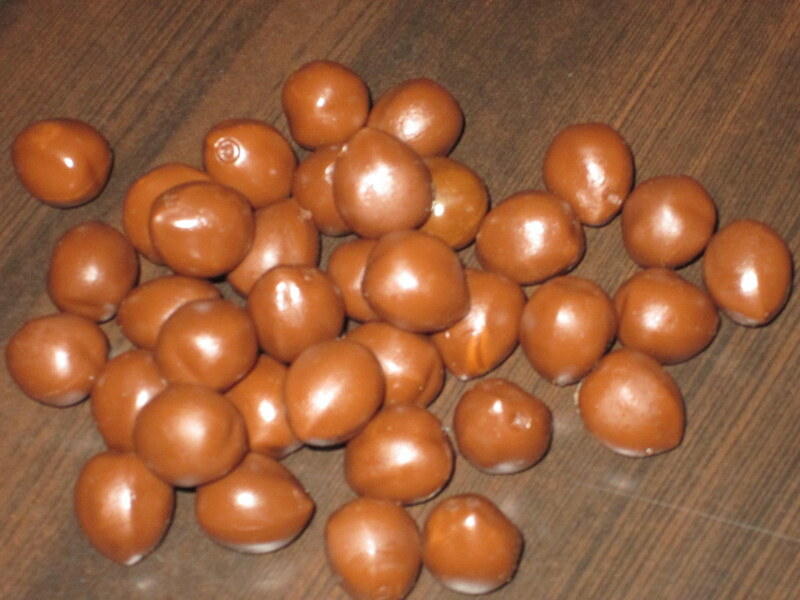 See, I told you they look like Milk Duds. If you like silly dexterity games in the vein of Click Clack Lumberjack, there is no question: you will love Coconuts. It hits all the similar categories I love: a ludicrous premise, a ridiculous challenge, yet rewarding repeat plays and encouraging trick-shot bravado. Even if you don’t like silly dexterity games, I think you might like Coconuts. Really, Coconuts is a winner if you don’t take it too seriously. And, believe me: if you sit down at a table with a monkey catapult, “serious” is a descriptor very unlikely to cross anyone’s mind. iSlaytheDragon would like to thank Mayday Games for providing us with a review copy of Coconuts. This very might be my game of the month, and I’m glad you’ve really enjoyed it too. I’m actually not a big fan of dexterity games–I enjoy them, but I don’t get excited to play them. That’s not the case with Coconuts for some reason. As you wrote, the components play a major role in the fun factor, particularly the monkeys and the coconuts themselves. It just WORKS. 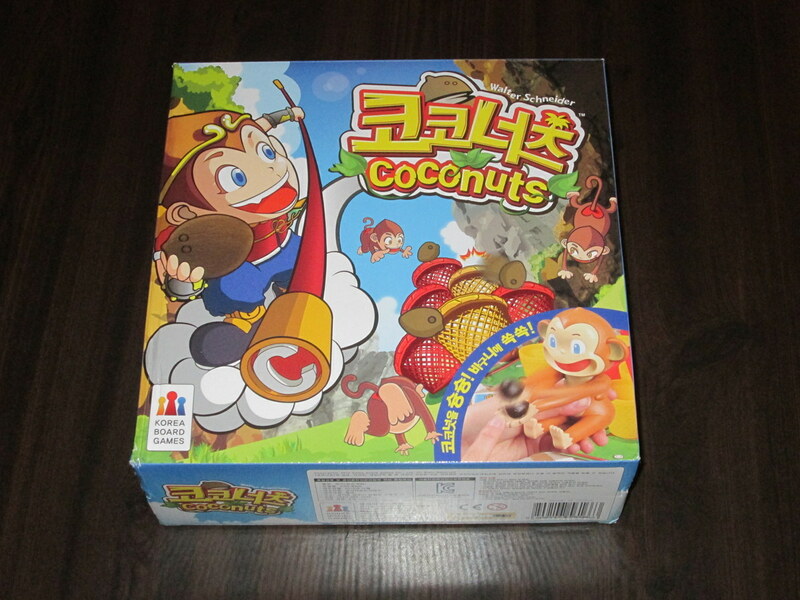 As much as I love engine-building Euro games, for sheer fun factor, Coconuts is near the top of my list.